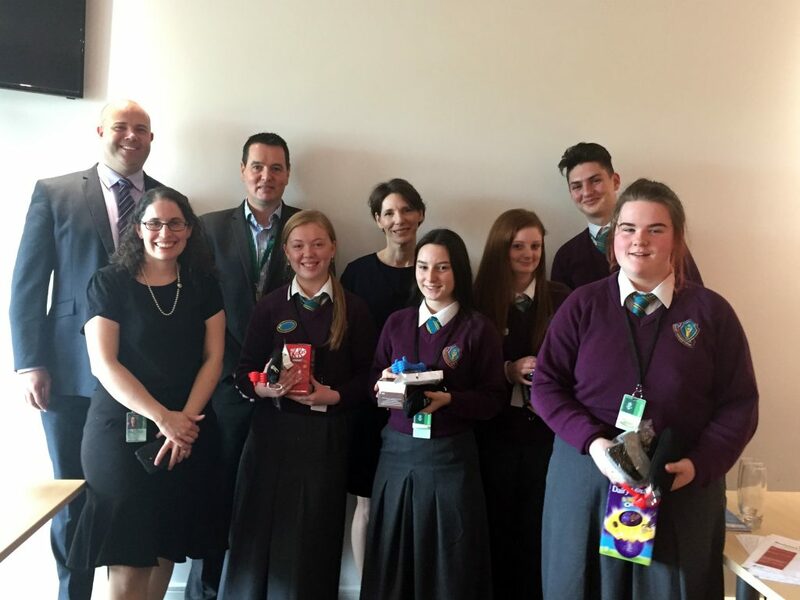 A group of Transition and Fifth Year students has a fabulous day in Northern Trust thanks to Heather Hamilton, Vice President, Global Training Manager and all the staff in NT who went to so much trouble to make the day educational and really enjoyable. We got a great insight into the variety of careers accountants do. In Northern Trust they look after Wealth Management and Asset Management for companies and very rich people (You must have at least €20 million before being accepted as an NT client). We all got a delicious lunch courtesy of NT, lots of snacks and refreshments all day. We all very much enjoyed a Dragon Den style Entrepreneurial Skills Competition where the students had to design a product for sale at a music festival. All teams then had to present their idea to three Senior Management Judges from NT. Michele Foley – Senior Vice President, Head of Alternative Investment Services, James Murphy – Senior Vice President, EMEA Financial Controller and James Mahon – Senior Vice President, Head of Ireland Financial Reporting. The winning team is pictured, Sarah, Katelynn, Rebecca, Jordan and Ciara and they designed a SAFE CUP which detects drugs and can warn you that your drink has been spiked! Generous prizes were awarded and indeed everyone got some nice memorabilia of a great day. Some other staff of NT, Adam McGrath, James Hall and Claire McMahon kindly volunteered to give up some of their working day to sit with the students and give their insights into their roles within NI. Mr. D. Kelly, a Business/Accounting teacher and Ms, M.O’Sullivan, a Guidance Counsellor were really appreciate of the great efforts of Heather and all her team in NT to ensure we had a very good day with the company. It was well worth the visit and has given the entire group who participated a much better insight into the business world and into accounting in particular.